I always found the pungent flavors of Ethiopian Injera and its spongy texture enigmatic. Breaking a piece of Injera, pinching and rolling it over bite size piece of slowly simmered vegetable or meat from Ethiopian stew, Wot, is a memorable culinary experience for me. Tiny bubbles on the surface of Injera and its spongy texture perfectly soak up the flavors of Wot. I only had Injera at restaurants or ones bought from Ethiopian groceries. A few months ago, I asked my Ethiopian friend, A’da, to teach me how to make Injera from scratch. I was surprised by her answer that most young Ethiopians don’t make (or even know how to) make it. Many Ethiopians in Addis Ababa (the capital of Ethiopia) and Washington DC, which is the home to the largest ex-pat Ethiopian community, buy ready-made Injera from the market. Indeed getting Injera from the market is exactly similar to how most of us get our bread. Culture of making Injera, which is staple bread for Ethiopians, has suffered the same fate as the culture of baking bread for everyday use at the homes – limited to a few culinary crusaders. So when she went back to Ethiopia, I asked her to learn how to make Injera. She came back with information that needed tedious preparation, traditional bread starter and the purchase of additional equipments such as clay pan. It was discouraging because I wanted to make Injera that was relatively easier to make. 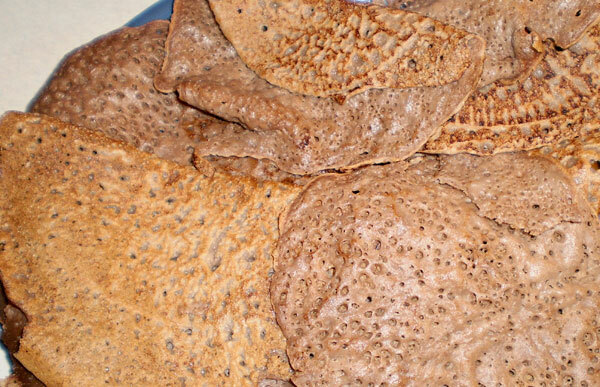 Conceptually, Injera can be considered very similar to a sourdough crêpe. 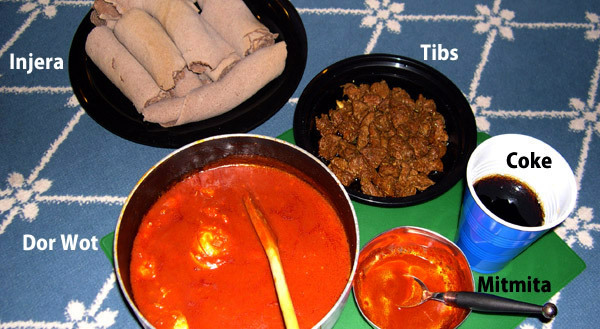 Instead of flour, Injera uses flour from grain of teff, which is the staple food in Ethiopia and Eritrea. Teff has somewhat tangy, earthier, nut-like complex flavor. It is high in dietary fiber and protein, but contains no gluten making it suitable wheat substitute for people with gluten intolerance. Even if it’s not authentic, using modern techniques at our disposal such as instant yeast, we should be able to make something worth serving at Ethiopian (American) table. Here’s how I made Injera from scratch. Get following items. 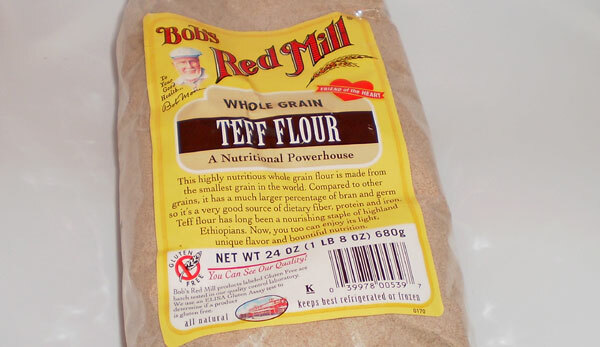 Mix teff with all purpose flour. Add yeast. Add water and mix to make a thin batter. If you forget to add yeast, you can always add it later, like the way I did. Cover the batter for 4 to 6 hours. The more time will result in stronger yeasty flavor and shorter time would result in milder flavor. After adding salt and spice, whisk the batter lightly. Heat the pan to high-medium heat. Wait for pan get to evenly heated. 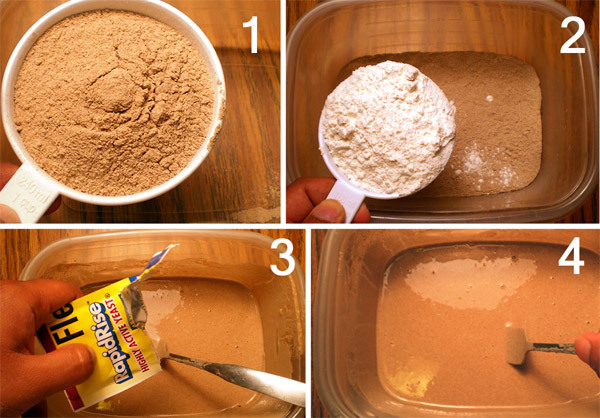 This is the most critical step in making Injera. Pour Injera batter on the hot pan, tilt the pan to spread the batter to make crêpe shape. Cover the pan for about 20 to 30 seconds after pouring batter. The Injera should be cooked by then. When Injera is cooked, it naturally detaches from the pan with a little effort. At first it seems somewhat crisp but once you let it rest, Injera would gain that spongy texture. This is the hardest part of making Injera. You need to get the temperature just right and practice. Even though my Injera was far from perfect, I am proud that I made it based on my intuition without help from anyone who had experienced or firsthand knowhow in making Injeras. It was the nicest Injera (not tastiest) I ever ate, simply because I made it. 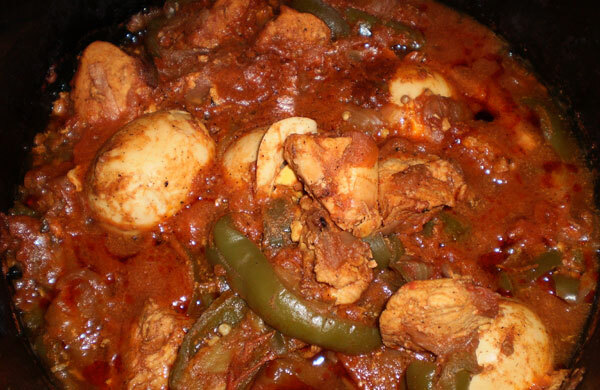 Doro (chicken) Wot (stew) is, perhaps, the best accompaniment for Injera. Technically, mine is Ye’doro Wot because I added hardboiled eggs to the stew. For my version of Doro Wot, I threw in cut pieces of boneless chicken, peeled hardboiled eggs, sliced bell peppers, caramelized onions, sliced zucchini, diced tomatoes and tomato paste into a slow cooker. I added organic tomato paste* to enhance the rich tomato flavors. Before adding onions, I sautéed them in pan to get a caramelized flavor. I spiced the stew with Berbere from Ethiopia, garlic, lime zest, lime juice, jalapeño peppers, and salt. You can change the amount of ingredients or switch some key ingredients to suit your preference. The most important ingredient in this recipe is Ethiopian Berbere, which is Ethiopian chili powder blend that you can find in any ethnic shops or online. Berbere is a spice blend in which the flavor of chili pepper is enhanced by other spices, such as coriander, cloves, cardamom, fenugreek, cumin, ginger and/or other spices according to spice maker’s preference. My Berbere was homemade and came directly from Ethiopia (thanks to A’da). Here’s a conceptual recipe for Berbere. Roast, ground and mix all the ingredients below. After Berbere, the second most important ingredients are tomato and onions for its sauce. There isn’t any basic recipe since I threw in everything together and cooked for 4-6 hour. Some of the ingredients, such as zucchini, jalapeño peppers and boneless chicken breasts are not the typical ingredients for the Wot. Here are the list of ingredients that I used for my Doro Wot. I highly encourage you to taste the Doro Wot when it’s initially cooked and adjust the other ingredients, especially seasonings. Just remember that there is no one standardized Ethiopian version or recipe of Doro Wot – so feel free to make your own version of Doro Wot. * When you buy tomato paste, please be sure to buy “organic” that just had tomatoes as ingredient. Many other tomato paste come loaded with tons of other additives such as corn syrup that you may not want to consume. 7 comments for this post. Very Impressive!. What a great post! I am a huge fan of injera and always wondered if it is possible to make it at home. Congratulations on getting it right. i envy u for trying it, it is brave of you to even consider making it. well in Doro WOtt there is no jalepno/ greeen pepper as i can see from the pic. But good Job for trying!!!!!!!!!!!!!!!! @Nan, thanks for the compliment but I still need to hone my Injera making skills..
@Chika, thanks for the comment. I know that Doro Wott does not have jalapeño, greeen peppers or zucchini usually. However, this was my version of Doro Wot with things I thought would go well with Doro Wot. Good job on the injera. I have had many batches that have come out to be terrible. I just keep trying and trying. I want to get it right so that I can teach my daughter how to make it one day.